From day one, we were blown away by the sublime quality of Rusutsu snow which could only be described as white gold descending from above. While immersing yourself in Japans rich culture, you'll experience the deepest powder turns, the thrill & spills of Hokkaidos largest theme park and the greenest of greens on the championship 72 hole golf course.......800m from your door step. Rusutsu is the perfect family ski destination and the resort certainly caters for this. After working and traveling to many ski resorts around the world, this was the only place we could imagine bringing our young family to, time and time again. Rusutsu is still considered a traditional Japanese ski resort so the night life is limited to a few bars. This means the party crowds and boys trips tend to stay in Niseko. Rusutsu resort is the ultimate summer/winter destination. Shirokin Chalet features the following. This place is fantastic! Great for a group of 8 to 10. Spacious rooms and well equipped. Great internet speed, and even free netflix to watch. Definitely will want to stay here again next time! Seven friends and I had the pleasure of staying at Shirokin Chalet this winter and it was an absolutely fantastic experience. 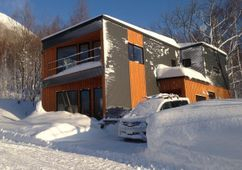 There was plenty of room, the house was always warm, and it is within an 8-minute walk of the Rusutsu Resort chairlifts. The location is secluded while still being close to lots of good skiing, so we found that a rental car was not necessary. Paul and Andrea, the property manager who lives close by, were both excellent communicators and hosts. Paul also owns a five-star Korean restaurant in Kutchan that is very tasty. I can't say enough good things about our stay at Shirokin Chalet. I would highly recommend it to anyone.